Tarazod Films & Media LLC: February 3rd at the Victoria Film Festival! The Victoria Film Festival has announced its official 2009 line up! 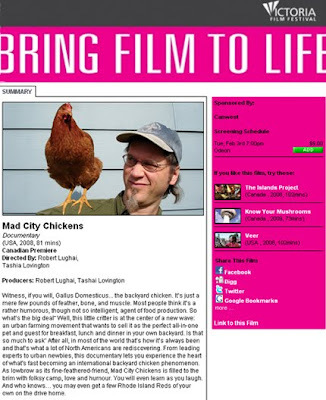 Mad City Chickens is scheduled to screen on February 3rd at 7:00pm. For those of you in the Victoria, BC area, tickets are now on sale and can be purchased through the VFF website.